Lockheed Martin plans to open a test track in June for the unmanned ground vehicles it is supplying to the Army’s Future Combat System (FCS) program. The company has invested $1 million in the nearly 20-acre site near Grand Prairie, Texas. It features a half-kilometer concrete oval test track, which eventually will be lengthened to accommodate a half-klic-long straightaway for speed trials. The Defense Advanced Research Projects Agency has selected 53 teams as semifinalists in its ongoing Urban Challenge robot contest. 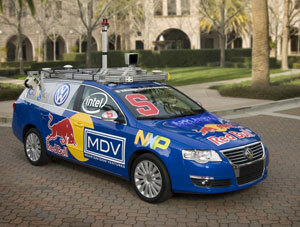 Urban Challenge is the third in Darpa's series of contests designed to foster research into unmanned ground vehicles. In 2004, Darpa asked university and industry teams to design and build a vehicle that could traverse a 142-mile desert course. None of them made it more than a few miles. In 2005, four teams successfully completed a similar 132-mile desert course in less than 10 hours. Now, Darpa is asking researchers to design and build a car that can navigate busy, four-way intersections and traffic circles, merge into moving traffic and avoid obstacles. (Insert obvious joke here about how most humans can't do all these things). When I approached the Recon Robotics booth at the annual Mock Riot in West Virginia last week to see the dumbell-shaped "Throw Bot" in action, David Gustafson told me to check back later -- the bot needed charging. Half an hour later it was still charging. And a half hour after that. Finally, the little drone was ready, and Gustafson tossed it across the room for a quick demo. One Danger Room reader isn't surprised at this delay. "We had six of these in the Al-Anbar province," he reports. "Battery life wasn't too good -- we never used them." I'm no stranger to military robots, but I'd never seen this one before: a tiny, two-wheeled contraption, trailing a camera on a wire, looking for all the world like a 2.5-pound dumbell. David Gustafson from Recon Robotics was showing off a couple of these little guys ("Recon Scouts," he calls them -- terrible name) at the Mock Riot in Moundsville, West Virginia, this week. After letting one bot charge for a few minutes, he underhanded it across the show room. It skittered to a halt. Then Gustafson grabbed a handheld controller with a tiny screen and drove the thing over the toes of a rather unimpressed young woman. It wasn't terribly fast and the camera was of the most basic type, but the bot seemed responsive and the ability to simply chuck the thing across the room was quite impressive. Boeing and iRobot, makers of the Army's handy PackBot unmanned ground vehicle and the Roomba home vacuum cleaner, have teamed up to make a new robot for the military called the SUGV Early. Not sure why they can't come up with a better name, but that's what they're calling it. 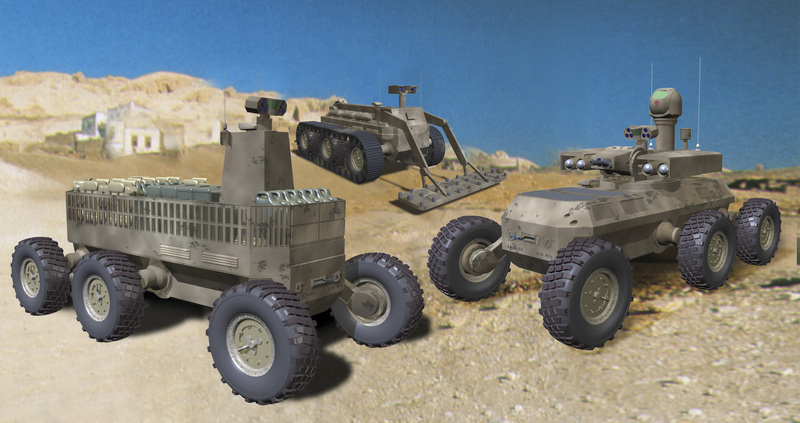 SUGV stands for small unmanned ground vehicle. The Early will be a lighter, smaller version of the PackBot that weighs in at 30 pounds, which the companies call "backpackable." Conceivably, 30 pounds is backpackable, but if you're already carrying 30 pounds or more of gear a 30-pound robot is just a big pain-causing backpack. Unless it's really handy, which the folks at Boeing and iRobot assure us the SUGV Early will be. 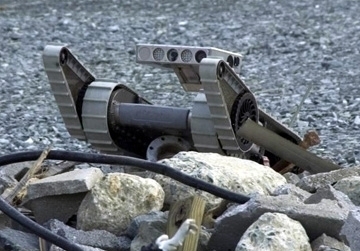 The Early will carry a video camera, commercial electro-optics, infrared sensors mounted on an "articulated manipulator arm" and tracked "wheels" that enable it to navigate rough terrain and stairs. The Early will be deliverable in 2008. Today's unmanned systems are great and all, but can they flatten themselves out and slither under a door like a rat? Unfortunately not, although if you've developed a robot like that, or have some experience in the convergence of soft materials chemistry and robotics, the far-out scientists at the Defense Advanced Research Projects Agency would like to hear from you. Darpa unveiled a new program on Friday that promises to turn hard-edged, steely robots into soft, fuzzy flexible creatures that can squeeze through holes in walls and windows that are smaller than the biggest parts of their bodies.